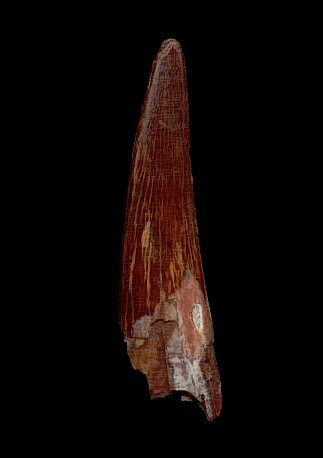 This is a very cool tooth of Siroccopteryx moroccensis from the Cretaceous of Morocco. Siroccopteryx moroccensis was not a ''true'' dinosaur, but rather a flying reptile. This 3-dimensional tooth is nicely preserved and has wonderful, maroon-brown color. Some of the root of the tooth is intact. The tip of the tooth is in very nice condition. This is a distinct specimen of a tooth from a Cretaceous Pterosaur.